UFC heavyweight champion Daniel Cormier takes a shot at WWE Universal Champion Brock Lesnar on Twitter. Cormier defeated Stipe Miocic for the UFC heavyweight championship in the main event of UFC 226 this past summer. 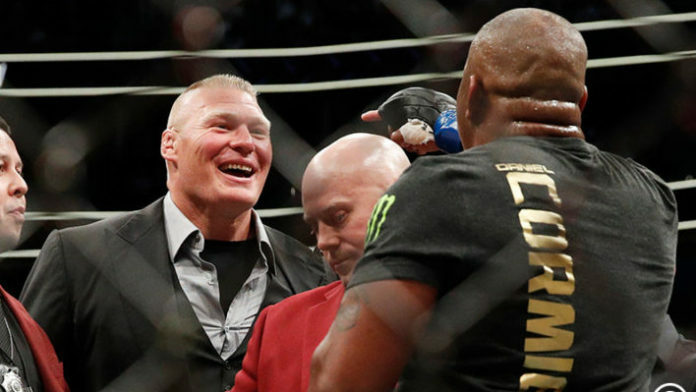 After the fight, Lesnar, who was seated cageside, entered the Octagon. The pair engaged in a shoving match, before Lesnar said he was coming after the heavyweight title again. Lesnar won the UFC heavyweight title back in 2008 when he defeated the legendary Randy Couture. After two successful title defenses, Lensar was defeated by Cain Velasquez in October of 2010. Lesnar’s last UFC fight took place in July of 2016, in which he defeated Mark Hunt via unanimous decision at UFC 200. However, the fight was later overturned to a No Contest after Lesnar failed a United States Anti-Doping Agency (USADA) drug test. Now, after having served a suspension for the incident, he’s eligible to return whenever he likes. Lensar currently reigns as the WWE Universal Champion on Monday Night RAW. He’s expected to defend his title against Seth Rollins at WrestleMania 35 in April. Talk of a UFC fight between he and Cormier has been speculated for several months now. It remains to be seen what “The Beast” will decide to do next. Do you think Cormier and Lesnar will fight each other in the near future?